Flight plans are documents filed by pilots, or a Flight Dispatcher with the local Civil Aviation Authority (e.g., FAA in the United States), prior to departure. [Figure 2-2] They generally include basic information, such as departure and arrival points, estimated time en route, alternate airports in case of bad weather, type of flight (whether IFR or VFR), pilot’s name, and number of people onboard. In most countries, flight plans are required for flights under IFR. Under VFR, they are optional unless crossing national borders; however, they are highly recommended, especially when flying over inhospitable areas, such as water, as they provide a way of alerting rescuers if the flight is overdue. For IFR flights, flight plans are used by ATC to initiate tracking and routing services. For VFR flights, their only purpose is to provide needed information should search and rescue operations be required. Figure 2-2. 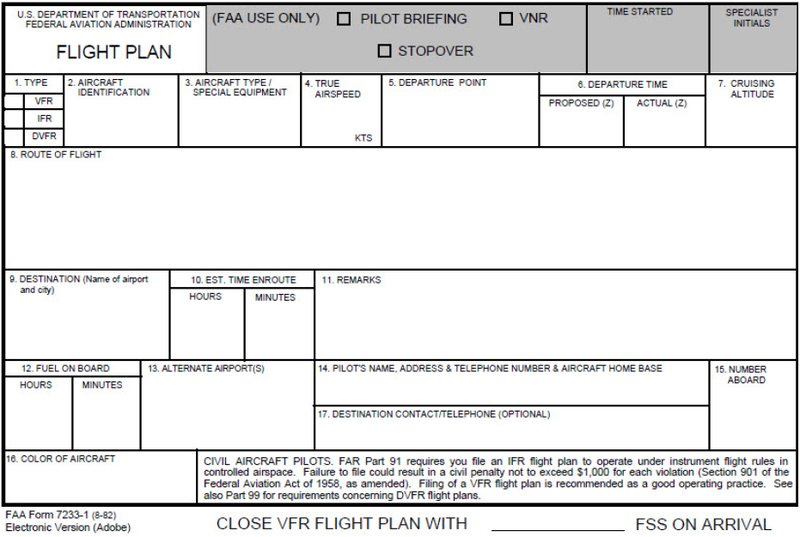 FAA Flight Plan Form 7233-1 (8-82). Flight plans are required for all flights into international and foreign airspace. The standard flight plan form is the FAA Form 7233-4, available at most U.S. Flight Service Stations (FSSs). [Figure 2-3] Flight plans must be transmitted to and should be received by ATC authorities in each ATC Region to be entered at least 2 hours prior to entry, unless otherwise stated in the various country requirements. It is extremely important that, when filing flight plans in countries outside the U.S., inquiry be made by the pilot as to the method used for subsequent transmission of flight plan information to pertinent en route and destination points and of the approximate total elapsed time applicable to such transmissions. Figure 2-3. 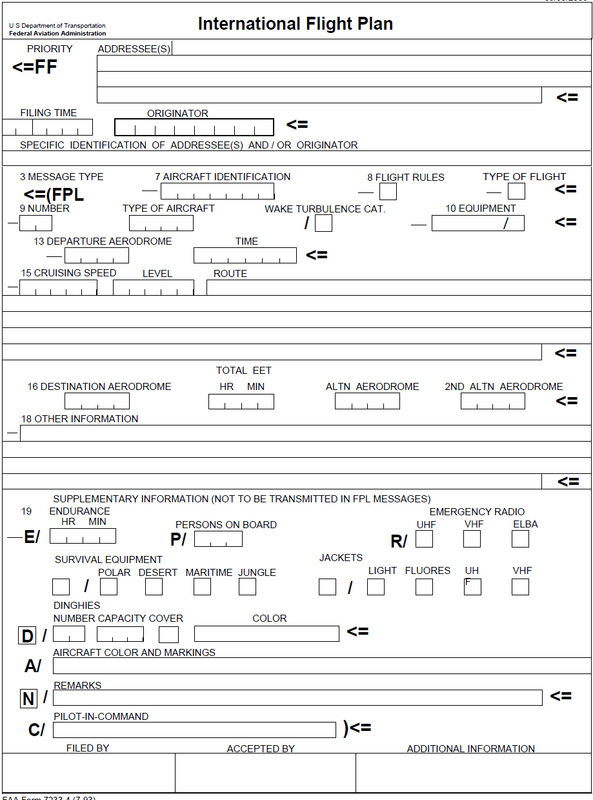 FAA Form 7233-4, International Flight Plan (7-93). En route fuel is determined with a fuel graph, such as the one depicted in Figure 2-4. Each type aircraft has a series of fuel graphs based on: aircraft gross weight, pressure or density altitude, true airspeed (TAS) or Mach number and, on some aircraft, the aerodynamic drag of external stores. En route fuel is computed in a manner that takes into account the worst fuel consumption situation, such as the lowest cruise altitude and highest airspeed. Most fuel graphs are designed for standard day conditions, so temperature deviation has to be considered. En route fuel can be calculated from the start descent point or initial approach fix (IAF). Fuel reserve is the quantity of fuel carried in excess of flight requirements if the flight is completed as planned. Add en route time and reserve time together to obtain the en route plus reserve time. The fuel to the alternate is based on the fuel flow for the gross weight of the aircraft at destination, TAS, and altitude flown to the alternate. Some flight manuals include graphs designed for computing fuel to the alternate, but the fuel can also be computed by adding the time to the alternate and to the en route time. This time is then used to extract the total fuel required from takeoff to alternate. En route fuel is then subtracted from this to obtain the fuel to the alternate. A standard fuel amount may be added to allow for a missed approach at the original destination. Adverse weather, air traffic, or aircraft malfunction in the terminal area may force the aircraft to hold in the local area for a period of time before landing. The amount of holding fuel is based on any planned delays according to applicable directives. Approach and landing fuel is the fuel required from the terminal fix to the runway. This is computed for a prescribed amount of time (usually 15 minutes). The amount of fuel needed for approach and landing varies with the aircraft. Total takeoff, or flaps up, is the cumulative total fuel from takeoff or flaps up that is required for en route, reserve, alternate, holding, and approach and landing. Taxi and runup fuel is the fuel needed for taxiing, engine runup, and acceleration to takeoff speed. It is usually a predetermined value for each type of aircraft. Required ramp fuel is the amount of fuel required at engine start to complete the flight. Actual ramp fuel is the fuel onboard prior to engine start. Additional fuel over and above that required by the flight plan is referred to as unidentified extra fuel. It is the difference between required ramp fuel and actual ramp fuel. Burnoff is the planned amount of fuel to be used after takeoff. This value subtracted from takeoff gross weight is equal to the approximate aircraft gross weight at landing. 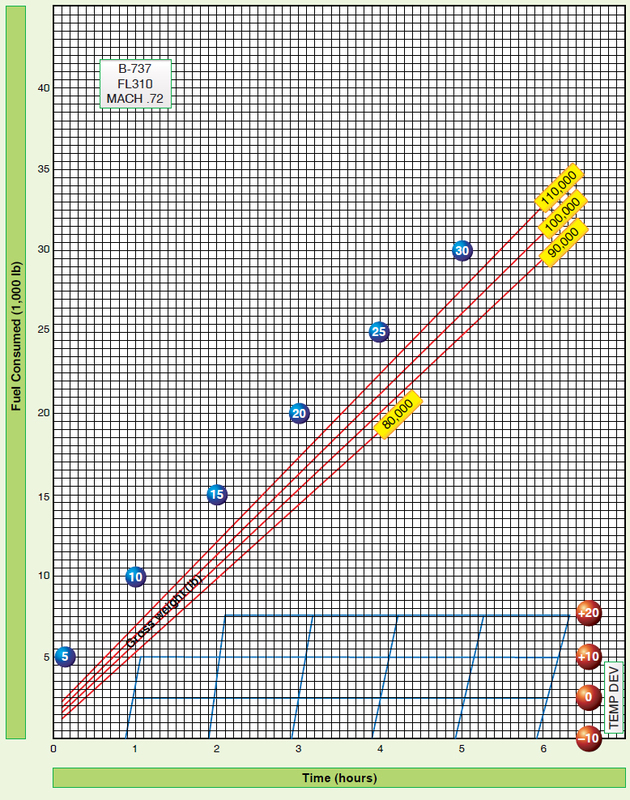 The range control graph portrays planned, minimum, and actual fuel consumption. 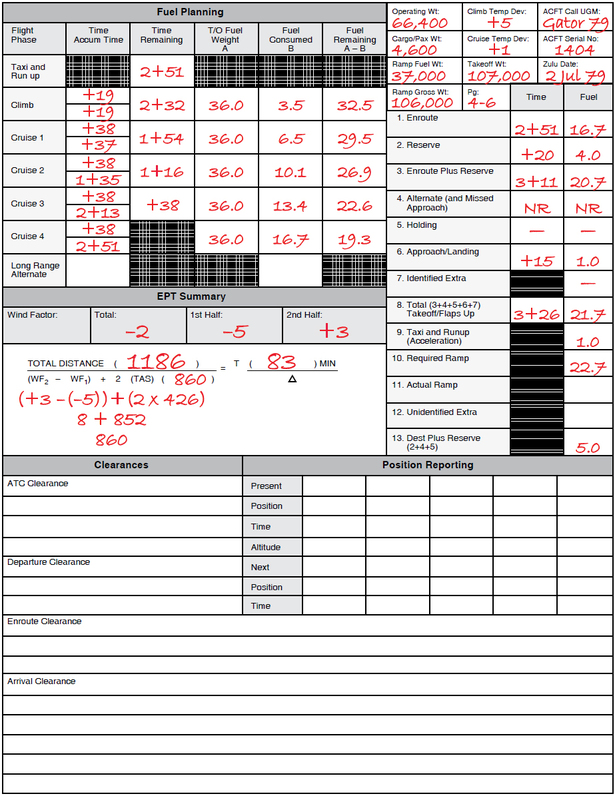 [Figure 2-5] It is used to flight plan fuel consumption and serves as an in-flight worksheet for comparing actual and planned fuel consumption. 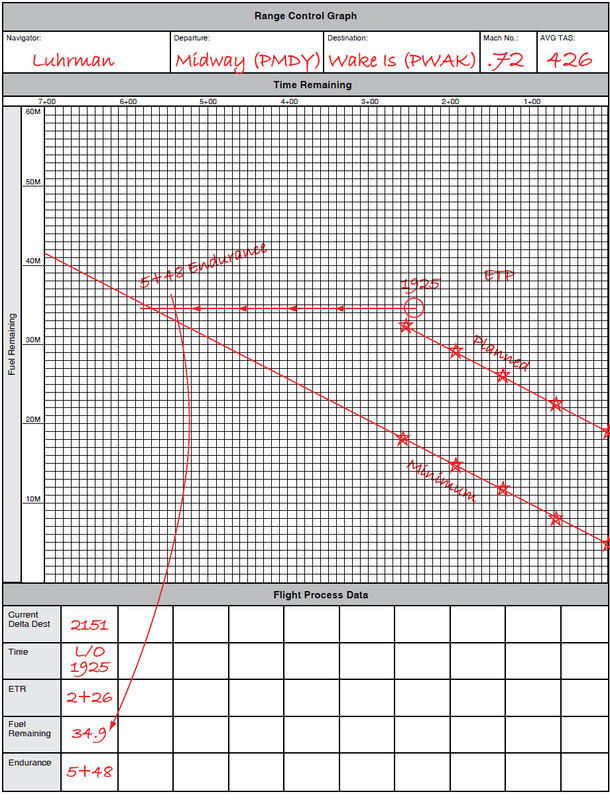 The range control graph can be constructed with information taken from a completed flight plan, such as Figure 2-2 and the applicable fuel planning graph in Figure 2-4. After calculating the required fuel at checkpoints along the route, the fuel remaining (vertical) is plotted against time remaining (horizontal). The planned fuel consumption is then plotted on the graph along with the minimum required fuel line. In-flight fuel readings are taken periodically and plotted on the graph to determine the fuel consumption in relation to that planned. Figure 2-5. Range control graph. Figure 2-5. Range control graph (continued). The planned line is determined by calculating the fuel remaining and time remaining at predetermined points in the flight and then plotting these points on the graph and connecting them with a line. The minimum line is determined by adding up all fuel required as a minimum at the destination (reserve, alternate, approach, etc.) and plotting it on the zero time remaining line. The difference between the minimum fuel required and the planned fuel on the zero time remaining line is then plotted below each of the predetermined fuel remaining points on the planned line. The points are connected with a line that represents the minimum required fuel line. This line is used to determine whether or not to continue the flight. In-flight fuel readings are obtained and plotted against time remaining to determine fuel status. These plotted points are then connected with a dotted line that represents the actual fuel consumption. The trend of the in-flight fuel readings indicates actual fuel consumption and is used to make flight decisions with regard to fuel. The equal time point (ETP) is that point along the route (normally one with an extended overwater leg) from which it takes the same amount of time to return to departure (or the last suitable airfield prior to beginning the overwater leg of the flight) as it would to continue to destination (or the first suitable airfield for landing). [Figure 2-6] The ETP is not necessarily the midpoint in time from departure to destination. Its location is somewhere near the midpoint of the route (between suitable airfields), and it is dependent upon the wind factors. Figure 2-6. Equal time point. Total distance is the distance in NMs from the last suitable airfield to the first suitable airfield, measured along the route of flight. WF2 and WF1 are wind factors for the second and first halves of the route segment, respectively. T is the time remaining in minutes from the ETP to the first suitable airfield. This time can be converted to distance by applying the GS for the second half of the route segment. The distance can then be measured uptrack and the ETP plotted on the chart. The time should be plotted on the range control graph with a vertical line that crosses both the planned and minimum lines. If the first suitable airfield is not the planned landing airfield, then the time should be added between the first suitable airfield and the landing airfield to determine the ETP. Endurance is the length of time an aircraft can remain airborne, not including minimum required fuel. Endurance can be computed by taking the last plotted fuel reading and following a line parallel to the fuel remaining lines in the direction of increasing time remaining until intercepting the minimum line. This point and its corresponding time remaining represent the endurance at the time of the fuel reading that is being used. Endurance is critical in making in-flight diversion decisions.